Saturday (Day 1) - Wake up at 4:45am. Ouch, its early. Load car, and pull out into thick fog. No worries, I think to myself, this will clear up once away from the Puget Sound. Turns out the fog extended past Ellensburg, nearly 2 hours away. Meet up with Kaj, Nils, and their tandem in E-burg and caravan past Yakima (under sunny skies) to Prosser, where we eventually meet up with the rest of the gang. Everyone else drove in the night before, and seem to be having a nice, lazy morning. We have 21 riders, plus other participants kind enough to support the ride. There is an energy in the air; we all know that the weather is on our favor and it is warmer than we would expect for 9AM in October. We may get away with something here; things look promising. Some riders are celebrating by cracking open cans of Pabst, breakfast of champions. 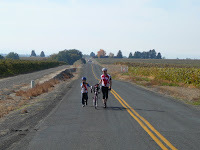 We are rolling by 10AM and within minutes are pedaling past vineyards. A few wrong turns are made, but we get back on course pretty soon. There are two support vehicles roaming around with us, carrying food, and everyone's camping gear for later that night. Great to have them along. I choose to ride sweep with Dave, making sure to scoop up any riders that have any problems along the course. It becomes obvious pretty quickly that homes out here have dogs that are 1.) unleashed, 2.) not fenced and 3.) game for a good chase. We fortunately reach the first winery without incident, only to find that it is closed because, of all things, they lost their liquor license! Turns out they have a small issue with paying their taxes. Still, we take the time to break into our food; there was a spam sighting at this location. Upon leaving, I immediately get a flat tire on the front; good thing we're sweep. After some roadside repair, Dave, Kaj, Nils and myself get to business. This is a great place to ride; mostly flat, beautiful scenery and few cars. While enjoying ourselves, Kaj realizes that he has a slow leak on his back tire; for the rest of the day, the name of the game will be refilling both once the other tire develops the same problem. We later scoop up Gina and Courtney, both victims of the tire revolution which has been unfolding before our eyes. We ride in a pack, sometimes lost, sometimes found, and nearly make it to the next checkpoint before Gina succumbs to flats once again. The medivac shows up and gets her and Courtney (who we later learn is battling a mean case of sick) out of there; Team Bune, Dave and myself continue. We are way behind schedule, are the last ones at the next winery, but later find ourselves arriving first at the campsite for day one. Yes, we are that awesome. Mexican dinner. 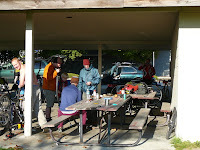 Most of the group camps at a city park in Zillah. I join Dave, Ellie, and their friends Dawn and Stern, in a teepee away from camp. Evening temps drop to the mid-thirties. 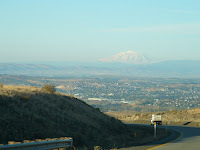 I hear there was quite a party back at camp (the Thrilla in Zillah), with sightings of karaoke, Moir, and shots. Someone may have to fill us in on what happened there. Sunday (Day 2) - I wake up, only to hear Dave tell me that my back tire is flat. Nothing better than starting your cold morning with grimey hands. 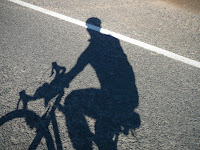 The ride itself gets underway around 10AM, and this time, Giro Dave makes an appearance and rides on the front of the group. 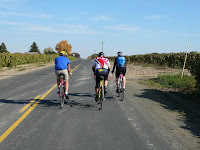 We get a paceline going with 6 riders, then 5, then 4, but motor to the first winery PDQ. Wine tasting is a funny thing; it is a presentation, and there is an order to it. All it lacks are powerpoint slides. They usually start you with a lighter, dry wine like a chardonnay or grigio, then move you to the other side, where you'll find cabernets, merlots, etc. This repeats numerous times throughout the day. At Tucker Cellars outside Sunnnyside, we end up having lunch and hanging out. I pick up a few bottles of vino there because its tasty, but also because the woman working there was more than willing to put up with our crazy group and even take pictures of us. In the afternoon we continue, and seemingly hit the heart of the vineyards. Temps in the lower seventies. Miles after miles of rolling hills. 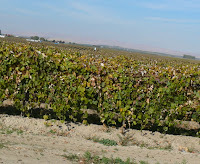 The sun hits the grapes, wherein they release a sweet, pleasant smell. It is glorious. Kaj names it 'Little Tuscany' and I think he has hit the mark. The tires continue to fight back for many, but none of it matters now. We have found what we came searching for: scenery, friends, shared experience, and small adventure. I want to thank everyone who organized this event; we all know it was special and I can only hope that we get the chance to participate in something similar in the future. I know that Susanne would have been the ride's biggest fan, and I'd like to think that she taught us the importance of living in the now, and appreciating the value of those around us. One thing is certain: there is no way she would not have been on the top of that pyramid. Guaranteed. I made it through the 87 miles without a flat. Twice this week commuting home from work, flat tire. What's up with that?